We’ll talk and try to cover another huge topic today which is a topic from VMware VCP6.5-DCV Certification Exam preparation guide. VCP6.5-DCV Objective 3.2 – Configure Software-Defined Storage. We’ll cover vSAN, vVOLs, we’ll also talk about vSAN observer or creating storage policies. While the VCP6-DCV Study Guide has only 28 objectives, the VCP6.5-DCV Study Guide has 32 objectives to cover. (Note: If you want to participate and cover few topics, you’re welcome).You can find the exam preparation guide as well on the certification exam page at VMware. Single and Multiple Choice questions. Passing score 300, The number of questions is 70 and you have 105 min to succeed. This guide perhaps isn’t perfect, but it’s up to date, it’s free … Today’s lesson is very wide and very long. I don’t even know if we cover all topics enough deep. You can do several tasks when managing disk in VSAN cluster. Create a new disk group (when adding more capacity). Each disk group has to have 1 SSD for caching and at least one disk (or SSD) for capacity. You can monitor vSAN several ways, including CLI or vSAN observer utility. Navigate to the vSAN cluster in the vSphere Web Client > Monitor tab and click vSAN > Select Physical Disks to review all hosts, cache devices, and capacity devices in the cluster. You can select capacity device, to see in the lower pane the storage policy associated with the disk. Breakdown of the used capacity by object type or data type. See if deduplication or compression is enabled, and if yes, the savings. Select vSAN cluster in the vSphere Web Client > Monitor tab and click vSAN > Select Virtual objects to view all hosts and the corresponding virtual disks in the vSAN cluster, including which hosts, cache and capacity devices their components are currently consuming. You can see also the Physical Disk Placement to view device information, cache disk name, capacity disk name identifier or UUID, and so on. The Compliance Failures can show you a compliance status of your VM. If you select hard disk on one of the VMs and click the Physical Disk Placement tab to view the device information, such as name, identifier or UUID, number of devices used for each virtual machine. You can also see where the components are stored, on which hosts. The Compliance Failures allows you to check the compliance status of the individual VMDK. Virtual volumes are object exported by a compliant storage system. vVOLs correspond one-to-one with a VMs disk and other VM – related files. The virtual volume is created and manipulated out-of-band, not in the data path, by a VASA provider. With Virtual Volumes (VVols), VMware offers a new paradigm in which an individual virtual machine and its disks, rather than a LUN, becomes a unit of storage management for a storage system.Virtual volumes encapsulate virtual disks and other virtual machine files, and natively store the files on the storage system. The vVOL functionality is helping for better granularity. Instead of manipulating and arranging storage around features of a storage system, it’s vVOLs which arranges storage around the needs of individual VMs. Now it is storage which is VM centric. vVOLs are mapping virtual disk, snapshots, and replicas, directly to objects, which we call virtual volumes, on a storage system. This mapping allows vSphere to offload intensive storage operations (snapshots, cloning, replication) to the storage system. When creating a volume for each individual virtual disk, it is possible to set policies more granularly, more optimal. VMware vSAN can export an iSCSI and provide storage services to hosts which are outside of the vSAN cluster. iSCSI can also be consumed by dedicated hosts which needs more storage. vSAN provides iSCSI target service. External hosts can activate an iSCSI initiator which can transport block-level data to the iSCSI target exported by a vSAN cluster. The iSCSI target discovery is similar as used with dedicated storage arrays supporting block-level storage. You can configure multipath support for the iSCSI. VMware vSAN – VMware vSAN creates shared datastore by pooling local disk drives and SSDs from each individual host participating in vSAN cluster. It virtualizes the local physical storage resources of ESXi hosts and turns them into pools of storage that can be divided and assigned to virtual machines and applications according to their quality-of-service requirements. 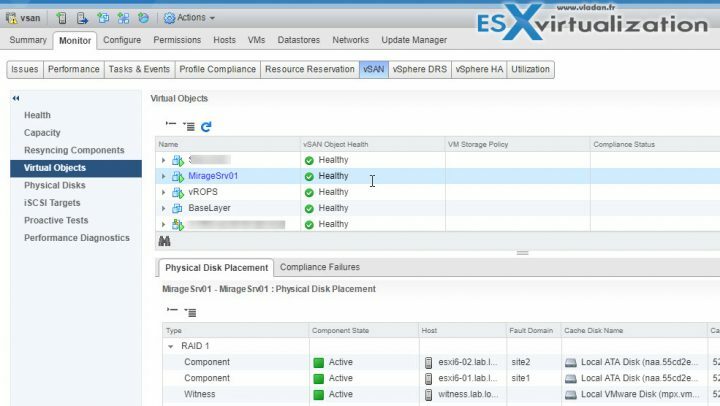 vSAN is implemented directly in the ESXi hypervisor. vSAN can be activated on existing cluster if storage controller, disks, SSD for caching are part of the HCL. You need at least one HDD and one SSD to create a disk group in each host of the vSAN cluster. Host from a vSAN cluster can have up to 5 disk groups. Each group has a maximum 7 capacity disks and 1 SSD for caching. vVOL architecture – The ESXi hosts have no direct access to the virtual volume’s storage. Instead, the hosts access the virtual volumes through an intermediate point in the data path, called the protocol endpoint. The protocol endpoints establish a data path on demand from the virtual machines to their respective virtual volumes. The protocol endpoints serve as a gateway for direct in-band I/O between ESXi hosts and the storage system. ESXi can use Fibre Channel, FCoE, iSCSI, and NFS protocols for in-band communication. When you enable VMware vSAN in your cluster, it automatically configures and registers a storage provider for each host in the vSAN cluster. The vSAN storage providers report a set of underlying storage capabilities to vCenter Server. They also communicate with the vSAN layer to report the storage requirements of the virtual machines. You can check whether storage providers are registered. Connect to vSphere client > Home > Select vCenter Server > Click the Configure tab, and click Storage Providers. The storage providers for vSAN should appear on the list. Each host has a storage provider, but only one storage provider is active. vCenter Server and ESXi use the storage providers to obtain information about storage configuration status, and storage data services offered in your environment. This information appears in the vSphere Web Client. Built-in storage providers typically do not require registration. For example, the storage providers that support I/O filters become registered automatically. When a third party offers a storage provider, you typically must register the provider. An example of such a provider is the Virtual Volumes provider. You use the vSphere Web Client to register and manage each storage provider component. Think of virtual infrastructure in few racks. If one rack fails, all the host within this rack fails too. vSAN intelligently spreads vSAN components through several racks or rather several “fault domains”. vSAN requires at least two fault domains, each of which consists of one or more hosts. Fault domain definitions must acknowledge physical hardware constructs that might represent a potential zone of failure, for example, an individual computing rack enclosure. On the image below you can see a vSAN installation having two fault domains. Each fault domain has one ESXi host and there is also a witness host which runs as a virtual appliance on a third ESXi host (outside of vSAN cluster). VMware recommends using at least four fault domains (FD) as some evacuation modes (full data evacuation) aren’t supported with three FD only. vSAN cannot rebalance the components if there is not the capacity left in another fault domain while doing a maintenance. You can provide local fault protection for virtual machine objects within a single site in a stretched cluster. You can define a Primary level of failures to tolerate for the cluster, and a Secondary level of failures to tolerate for objects within a single site. In the case that one site is down, vSAN maintains availability with local redundancy in the available site. VMware VSAN (hybrid) needs some spinning media (SAS or SATA) and 1 SSD per host (SATA, SAS or PCIe). VMware VSAN (All-Flash) needs some SATA/SAS for a capacity tier and 1 SSD hight performance and endurance for caching. HBA with RAID0 jor direct pass-through so ESXi can see the individual disks, not a raid volume. Multicast activated on the switch (Note that vSAN 6.6 and higher does not use multicast any more. It uses unicast). IGMP Snooping and an IGMP Querier can be used to filter multicast traffic to a limited to a specific port group. Useful if other non-Virtual SAN network devices exist on the same layer 2 network segment (VLAN). VVOls are here since vSphere 6. By using a special set of APIs called vSphere APIs for Storage Awareness (VASA), the storage system becomes aware of the virtual volumes and their associations with the relevant virtual machines. Through VASA, vSphere and the underlying storage system establish a two-way out-of-band communication to perform data services and offload certain virtual machine operations to the storage system. For example, such operations as snapshots, storage DRS and clones can be offloaded. VVOLs are supported on SANs compatible with VAAI (vSphere APIs for Array Integration). VVOLs with the virtual datastores are tightened to vCenter or if used with Host profiles, then only within this particular vCenter as the extracted host profile can be attached only to the hosts within the same vCenter as the reference host is located. Multipathing only on SCSI-based endpoints, not on NFS-based protocol endpoint. Virtual Machine Storage policies are covered vSphere Storage Guide on p. 225. Virtual machine storage policies are essential to virtual machine provisioning. These policies help youdefine storage requirements for the virtual machine and control which type of storage is provided for the virtual machine, how the virtual machine is placed within the storage, and which data services are offered for the virtual machine. SP contains storage rule or collection of storage rules. define a storage policy, you specify storage requirements for applications that run on virtual machines. After you apply this storage policy to a virtual machine, the virtual machine is placed in a specific datastore that can satisfy the storage requirements. In case of VSAN and VVOLs, the SP determines how the VM storage objects are handled and allocated within the datastore to guarantee the SLA. VSAN fault domains allow creating an environment where the in case of failure 2 hosts for example, which are in the same rack. Failure of all hosts within a single fault domain is treated as one failure. VSAN will not store more than one replica in this group (domain). Requirements: 2*n+1 fault domains in a cluster. In order to leverage fault domain, you need at least 6 hosts (3 fault domains). Using three domains does not allow the use of certain evacuation modes, nor is Virtual SAN able to reprotect data after a failure. VMware recommends 4 Fault domains. (the same for vSAN clusters – 4 hosts in a VSAN cluster). 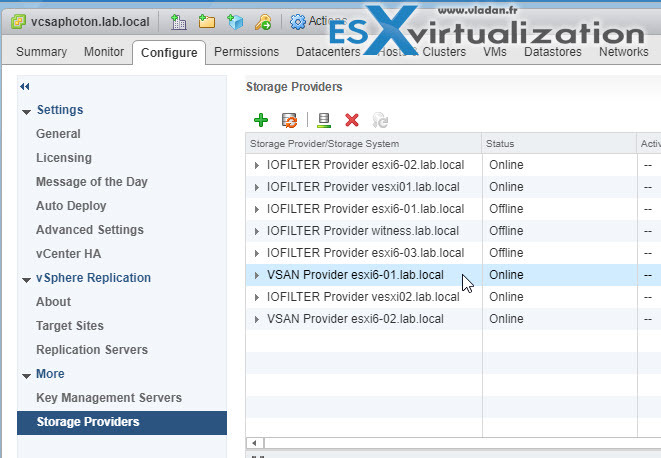 On the pic below you see my hosts are down, but VSAN still works and provide storage for my VM… (nested environment). You can only include hosts that are 6.0 or later in fault domains. If a host is not a member of a fault domain, Virtual SAN interprets it as a separate domain. Virtual Volumes supports such vSphere features as vSphere vMotion, Storage vMotion, snapshots, linked clones, Flash Read Cache, and DRS. You use the VM Storage Policies interface to create a storage policy. When you define the policy, you specify various storage requirements for applications that run on the virtual machines. You can also use storage policies to request specific data services, such as caching or replication, for virtual disks. You apply the storage policy when you create, clone, or migrate the virtual machine. After you apply the storage policy, the SPBM mechanism assists you with placing the virtual machine in a matching datastore. In certain storage environments, SPBM determines how the virtual machine storage objects are provisioned and allocated within the storage resource to guarantee the required level of service. The SPBM also enables requested data services for the virtual machine and helps you to monitor policy compliance. (Note there is double dash before “run” and before “force”, but WordPress sometimes cut this off). VM Storage policy control which type of storage is provided for the virtual machine and to which storage the virtual machine is placed. They also determine data services that the virtual machine can use. Virtual volumes are encapsulations of virtual machine files, virtual disks, and their derivatives. Virtual volumes are not pre-provisioned but created automatically when you perform virtual machine management operations. These operations include a VM creation, cloning, and snapshotting. 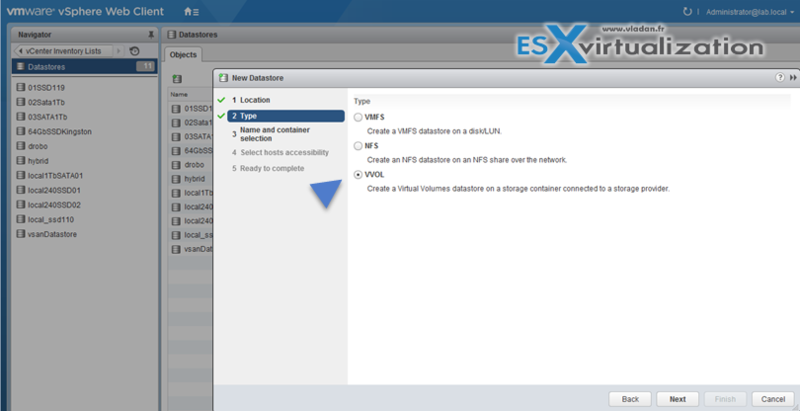 ESXi and vCenter Server associate one or more virtual volumes to a virtual machine. 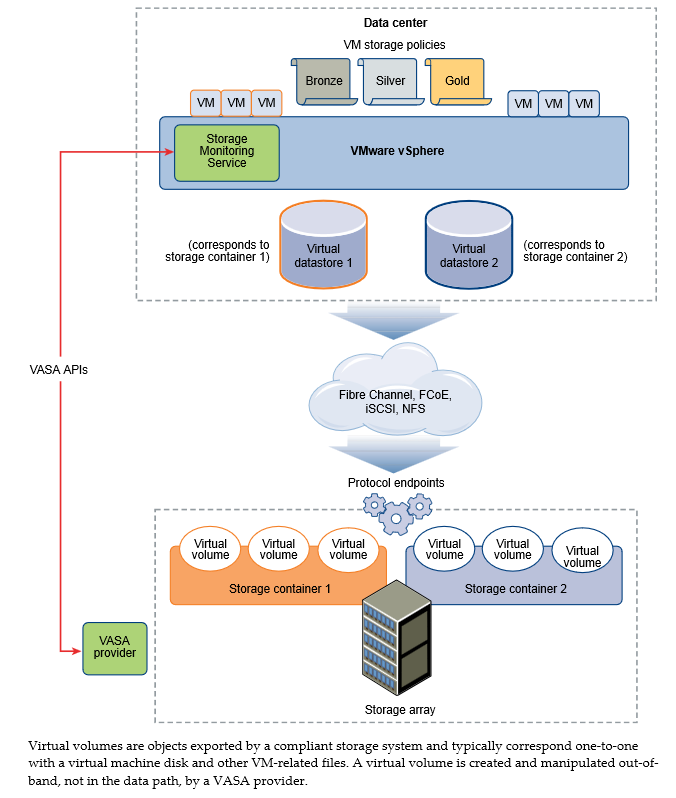 Storage Provider – A Virtual Volumes storage provider, also called a VASA provider, is a software component that acts as a storage awareness service for vSphere. Storage Container – A storage container is a part of the logical storage fabric and is a logical unit of the underlying hardware. The storage container logically groups virtual volumes based on management and administrative needs. Protocol Endpoints -ESXi hosts use a logical I/O proxy, called the protocol endpoint, to communicate with virtual volumes and virtual disk files that virtual volumes encapsulate. ESXi uses protocol endpoints to establish a data path on demand from virtual machines to their respective virtual volumes. Virtual Datastores – A virtual datastore represents a storage container in vCenter Server and the vSphere Web Client. (optional) Change the path selection policy (psp) for protocol endpoint. Wrap Up: A very long post indeed. If you decided to study, I can assure you that not all topics are that long. There is 32 Objectives to cover and so far we have covered 3 of them. The topics are covered in no particular order. 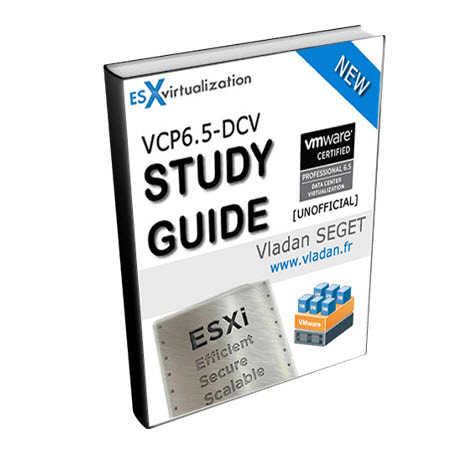 Check the Full VCP6.5-DCV Study Page for all documentation, tips, and tricks. Stay tuned for other VCP6.5-DCV topics -:).